Upon what meat doth this our Caesar feed. That he is grown so great? ARISTOCRATIC ROMANS USUALLY BORE three names. For example, Gaius Julius Caesar (born 13 July 100 BCE), son of Gaius Julius Caesar (died 85 BCE) belonged to the Caesares family of the large Julian clan (gens Julia in Latin). Young Julius would live to make the name “Caesar” not merely famous, but a title for emperors and their sons; a title that would endure for millennia, becoming Kaiser in German and Tsar in Russian. In 63 BCE he was elected Pontifex Maximus, high priest of the Roman state religion. Between 58 and 50 BCE Caesar conquered the Celtic tribes of Gaul, bridged the Rhine to fight the Germans and launched an expedition across the Channel into Britain. In 49, he began a civil war against the Roman Senate. To pay his armies he struck an immense issue of silver denarii bearing his name beneath an elephant on the obverse, and his “priestly implements” used in rituals on the reverse. These are by far the most common coins in Caesar’s name. Romans, who had overthrown their kings in 509 BCE to establish the Republic, were uncomfortable with the idea of depicting a living person on the coinage. 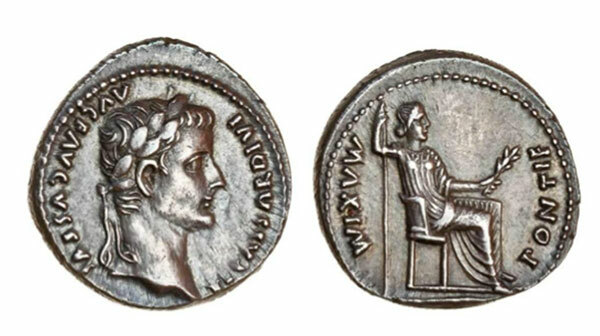 In January 44 BCE, the first portrait coins in the name of Caesar were issued, with only the title IMP (for Imperator, which at this period meant only military commander-in-chief). A month later, portrait coins were struck with the title DICT PERPETUO (“Dictator for Life”). There are several variants of this type, bearing names of different mint officials (“moneyers”). For the conservative faction in the Senate, this was the last straw. On 15 March 44 BCE Caesar was stabbed to death. 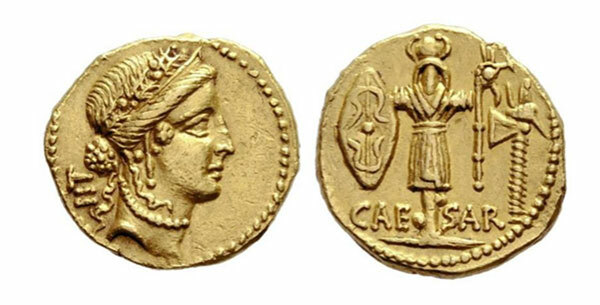 None of Caesar’s gold coins bear his portrait; many depict an uncertain female goddess (possibly Vesta). 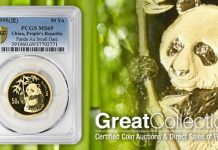 A particularly rare example struck by a military mint moving with Caesar’s army in 48-47 BCE sold for over $US300,000 in a recent European auction. The assassination of Caesar renewed the civil war, which ended 17 years later when his great-nephew Octavius received the title of “Augustus” from the Senate. Gaius Octavius, son of Gaius Octavius, was born 23 September 63 BCE. His mother Atia was the daughter of Julia, sister of Julius Caesar. When Caesar was murdered Octavius was 18 years old, studying in Illyria (now Albania). He learned that he was Caesar’s adopted son and heir when he returned to Italy. Since Caesar had been deified (posthumously declared a god by the Senate on 1 Jan 42 BCE), Octavius used the title DIVI F (Divi filus “Son of a God”) on his imperial coinage. The most common silver issue of his long reign was struck between 2 BCE and 4 CE; it features a reverse depicting his grandsons and designated heirs, Lucius and Gaius. Unfortunately, Lucius died in 2 CE and Gaius died two years later, both possibly poisoned. Tiberius, the son of Octavius’s wife Livia by a previous marriage, succeeded him. On much of his elegant gold coinage the only inscription is the word AUGUSTUS. 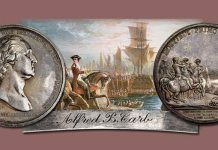 Although he lived to the age of 75 (remarkable for that era), his coin portrait remained youthful and idealized. A superb aureus of Augustus, with a reverse depicting a heifer, sold for nearly US$400,000 in a recent European auction. Tiberius was unhappily married to Julia, daughter of Augustus. Augustus disliked Tiberius, and adopted him reluctantly as his heir. The coinage of Tiberius is relatively common, but remarkably standardized (even boring) compared to the hundreds of different types issued in the name of Augustus. The obverse bore an idealized portrait, and the reverse depicted a seated female figure usually identified as Livia (mother of Tiberius, who died in 29 CE at the extraordinary age of 87). 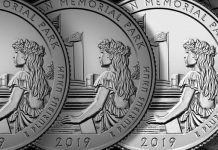 Biblical scholars generally consider the “Tribute Penny” of the Gospel story to be the current denarius of Tiberius (a “penny” at the time of the King James translation was a silver coin). The type is therefore in high demand, with VF or better examples commanding a premium over other contemporary issues that might just as well have been the type shown to Jesus. Caligula was born on 31 August in the year 12. His father Germanicus, nephew of emperor Tiberius, was a successful, popular general. Caligula’s mother, Agrippina “the Elder” was the daughter of Marcus Agrippa, the brilliant organizer behind Octavius’s victory in the civil war. “Caligula” means “little boots”, because as a child he wore a miniature uniform including military boots, to the delight of his father’s legionaries. He grew up to dislike the name. 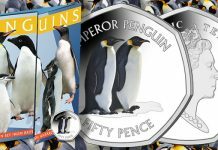 His given name–Gaius (or Caius) Julius Caesar Germanicus–appears on his coinage, variously abbreviated. 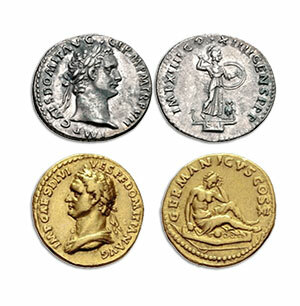 Caligula’s silver and gold coins are scarce – usually the most difficult types for completing a set of the Twelve Caesars. 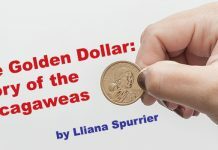 The coinage of Caligula is discussed in greater detail in a previous CoinWeek article. Following the murder of Caligula (24 January 41), the Praetorian Guard declared his uncle Claudius, aged 51, as emperor. He was slightly deaf, had a limp, and regarded as not too bright, but he was the last surviving male of the Imperial family. Claudius proved to be a surprisingly effective ruler for the next 13 years. In the English-speaking world, the perception of Claudius has been strongly shaped by Robert Graves’ historical novel I, Claudius (1934) and the superb BBC television series (1976) based on the book, with Derek Jacobi in the title role. In numismatics, Nero is remembered as the depraved emperor who debased the coinage. 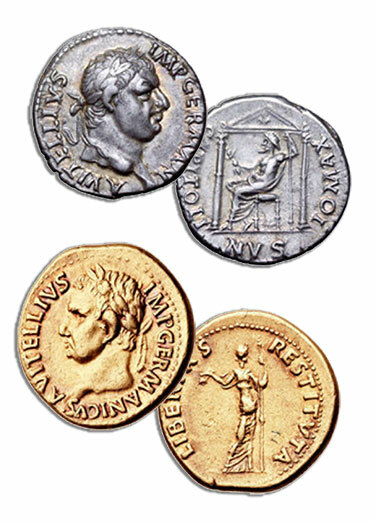 To cover his extravagant expenditures, Nero reduced the weight of the denarius from about 4 grams (84 per Roman pound) to 3.4 grams (96 per pound). The purity of the silver declined as well, from about 97-98% down to 93-94%. He also reduced the weight of the gold aureus from about 8 grams to 7.2 grams. Nero’s gold coins survive in large numbers and are some of the most affordable aurei of the Twelve Caesars; well-worn examples can sometimes be found for under $US1000. 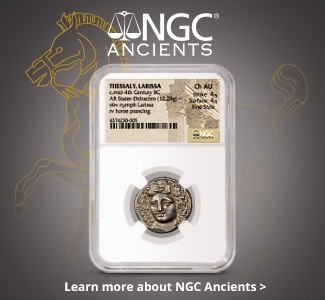 Nice denarii (recognizable portrait, readable inscription) in lower grades can still be found for under $200. Interestingly, the portrait of Nero on these coins reflects his gradual decline. On his earliest coinage as “Caesar” (heir to the throne under Claudius), he appears quite normal; on his imperial issues he becomes increasingly obese. Nero’s suicide resulted in another outbreak of civil war, remembered as the “Year of Four Emperors.” The governor of a Roman province in Spain, Servius Sulpicius Galba (born 3 BCE), was proclaimed emperor by his legions. The surviving members of the Roman Senate concurred. 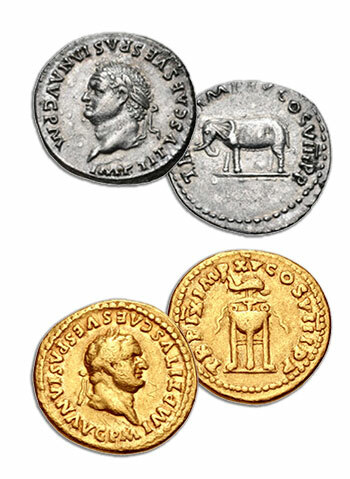 Galba’s coinage is surprisingly abundant, considering that his reign lasted only seven months (June 68 to January 69). His coins were struck in Spain, Gaul and Rome. Born in 32 CE, Marcus Salvius Otho was one of the wild young aristocrats in Nero’s retinue. Nero forced him to divorce his wife Poppaea, and sent him to govern distant Lusitania (modern Portugal), where he joined Galba’s revolt in 68. When his hopes to be designated as Galba’s successor were frustrated, he conspired with the Praetorian Guard to kill the emperor. Otho lasted only three months (15 January – 16 April 69), and it speaks well for the efficiency of the Roman mint that it was able to produce so much coinage in that brief period. Otho was vain about his appearance: “… and a well-made toupee covered his practically bald head”–a distinctive feature of his coin portrait. On the reverse of some types, the winged figure of Victory appears surrounded by the inscription VICTORIA OTHONIS (“Victory of Otho”). When the legions on the German frontier proclaimed their general Vitellius as emperor and marched on Rome, Otho was defeated in battle and committed suicide to spare Rome further conflict. Nevertheless, he defeated Otho’s forces and occupied Rome in June, 69. He lasted eight months, feasting up to four times a day on costly imported delicacies. When the legions of the East under the successful general Vespasian advanced on Rome, he tried to resign, but his troops would not allow it. He was hunted down and killed on December 22. 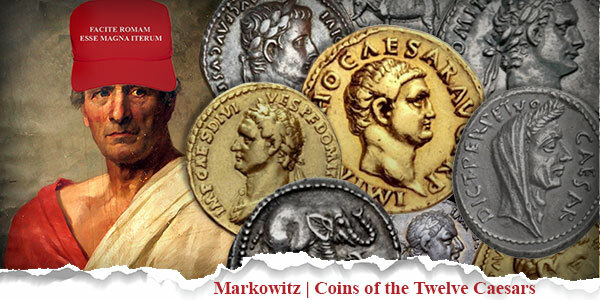 The coinage of Vitellius is quite scarce. Born in 9 CE, Titus Flavius Vespasianus was the son of a humble tax official. He rose through the ranks of civil and military service, and distinguished himself in the invasion of Britain (43 CE). 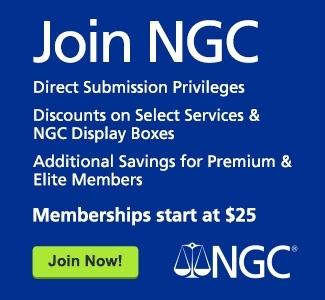 In 67, Nero sent him to crush a revolt in Judaea. The Jewish War dragged on until the year 73, finally being concluded by Vespasian’s son, Titus. On July 1, 69, the legions proclaimed Vespasian emperor at Alexandria. After the death of Vitellius, the Senate confirmed this. The eruption of Vesuvius occurred during his reign. 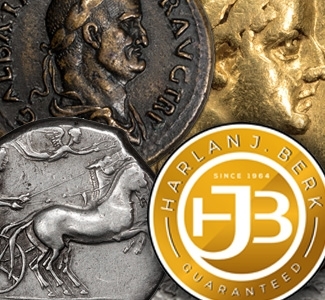 Vespasian’s best-known coins commemorate his conquest of Judaea, but a great many other types were struck during his 10-year reign, including many that depict his sons. Born in December 39, Titus was nearly 40 when he succeeded his father but lived only a further two years. The Arch of Titus in Rome commemorates his destruction of Jerusalem and triumph over the rebellious Judeans. His most famous coin is a very rare bronze sestertius depicting the Colosseum, the stadium built with the loot from the Jewish War. An example sold for US$155,000 in a recent auction. With Domitian we come to the end of the Twelve Caesars and nearly the end of the first century of the Common Era. Born in 51, he was about 30 when he succeeded his elder brother Titus. His coinage was prolific, probably the most abundant of the Twelve, and even in gold, collectable examples are relatively common. 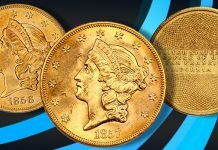 For centuries, assembling a complete set of the “Twelve Caesars” has been a challenge to the patience, persistence and budget of advanced collectors. In silver, a fairly good set of Twelve Caesar denarii (recognizable portraits, mostly readable inscriptions) could probably be assembled today for a few thousand dollars. In gold, even a relatively low grade set would be likely to retail for a sum in the high tens of thousands. Otho issued no bronze coinage as far as we know, so a complete set in bronze is impossible, except for some fantasies counterfeited during the Renaissance to satisfy collectors. Roman men were often named after their fathers. Women often bore the feminine form of their father’s name, so Cornelia might be a daughter of Cornelius. 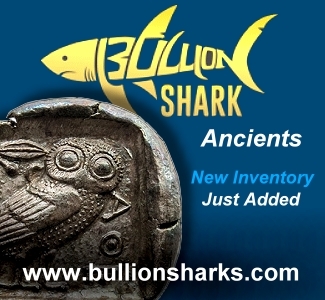 For an explanation of the symbolism, see http://ancienthistory.about.com/od/ancientarchitecture/ss/120612-Caesar-Elephant-Denarius-C-49-B-C.htm. To Romans, a “dictator” was an official granted supreme power for a year in time of national crisis, and expected to return to civilian life after the emergency passed: https://en.wikipedia.org/wiki/Roman_dictator. Augustus, meaning “deeply respected” or “revered,” became a title of every subsequent Roman emperor. The story also appears in Luke, 20:24 and Mark, 12:15. Some writers translate the word as “Bootikins”. Suetonius (285) provides a slightly different version.